A basket in Mintlaw Museum Store which could well be a traveller basket - it has the cross of St Andrew in the base and may even have been made by Willie himself. My first meeting with Willie McPhee was around 1993. I was given an introduction by someone who had done a lot of research into his knowledge of native plants and their uses. I had strict instructions about how to behave with the travellers as there are many taboos and it is easy to cause offence. These can relate to eating and drinking and so on. I went to visit Willie and his wife (I think her name was Bella) at their caravan at Doubledykes just outside of Perth. I was made most welcome and had many cups of tea as he told me about his basket making skills. They didn’t use native willows - ‘crack’ willow or ‘goat’ willow or weeping willow, - but there were some suitable varieties around and you could bite into the bark and the more bitter the better. He told me how the travellers had coppices of willow around the countryside, generally on river banks, where they encouraged this basket making willow to grow, coming back to cut it every year. This fitted with their seasonal life style. 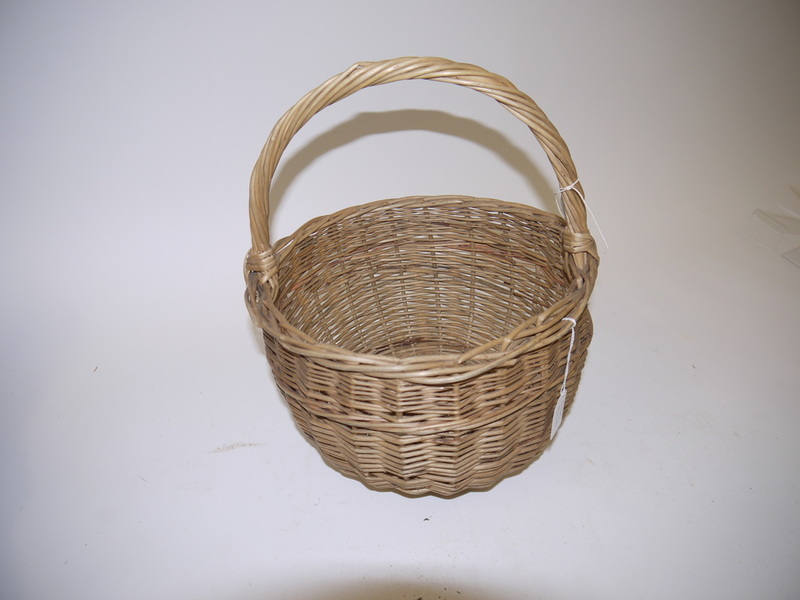 The willow was not necessarily used with the bark on but stripped and skeined for basket making. Willie got up and went outside and took out his penknife and cut a sturdy piece of wood from a branch. He brought it inside and shaped it exactly like an old fashioned clothes peg. This made a hand held brake perfect for stripping willow. He told me how once his caravan was washed into the river during bad flooding of the Tay. He was worried he would lose his basketry tools. When the waters had receded a bit he made his grandson swim into the river and through a caravan window to rescue them. These were a cleave and skeining tools, 2 little shaves which were for paring down the willow once it had been split. Willie also played the pipes and in the summer he and his family travelled round the highlands stopping in laybys to play for tourists and to sell baskets. He didn’t have any baskets left but he said he had been in many tourist photos so that would be somewhere the baskets may have been recorded. I wasn’t able to visit again but caught up with him at a Traveller celebration at the Scottish Storytelling Centre. This was around 1993 or 94. Willie was to demonstrate making a basket and I went along to watch. The organiser had offered to supply materials and she brought along bundles of cane. This was the wrong thing altogether and Willie wouldn’t use it so I offered to go back to my workshop and bring some willow. Luckily I had some very nice Somerset willow ready soaked - ‘New Kind’, lovely to use - and brought plenty back. This took time of course and eventually he started basket making much later in the day. Willie made a traditional stake and strand basket almost exactly as in Mary Butcher’s book - but to start the base he used the tips to make a ‘Cross of St Andrew’ to show it was a Scottish basket, Then he went on to make a base, stake up, upset with tips, then two or three rows of pairing and two sets of French randing brought the basket up to the rim. The border was a straightforward rod border - I think it was a 3 rod 1 behind border. Then he put on a handle. 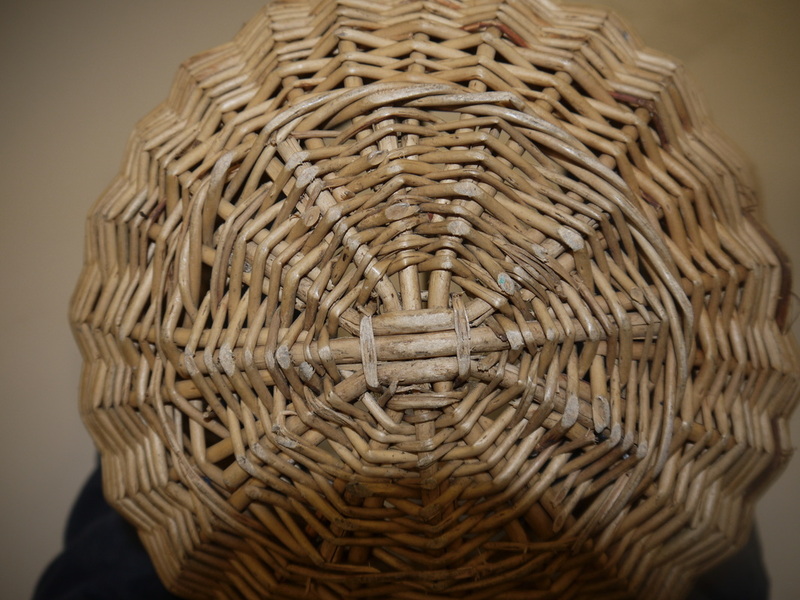 I have heard other stories about the Travellers and their baskets and once at a workshop in Alyth a local lady showed me a peg basket in white willow. 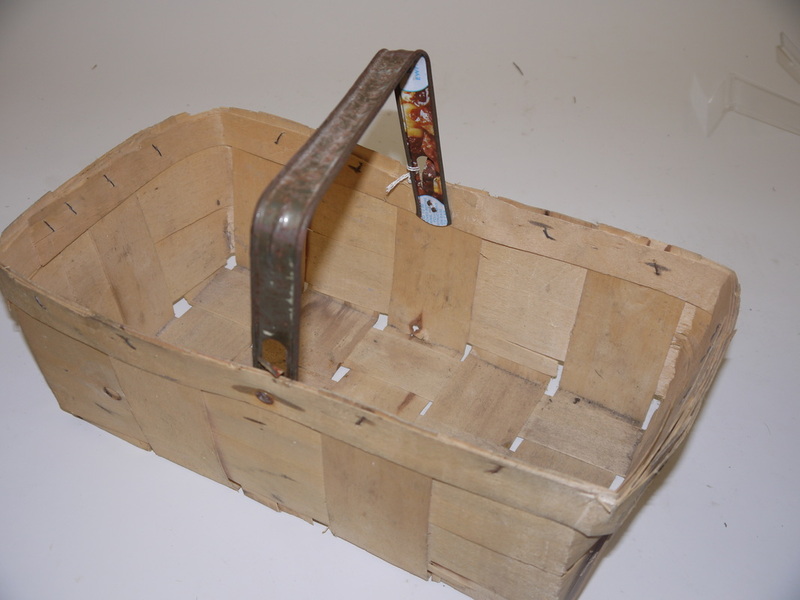 This was a frame basket and the washing line was run through the handle so that it stayed out with the pegs in it. I will see if I can hunt down the photo of it. In and around Edinburgh I have often been told of a traveller, Jonny White, who made babies rattles and occasionally baskets in return for money, beer or food. He was a bit of a drinker and banned from the pubs of the High St so he used to stand outside the World’s End bar and he would make you a rattle of willow with bottle tops for the rattle and you would go inside and buy him a pint of beer in return. He also used to go to the Braid burn in summer and make rattles for the families who came for picnics there. A work colleague of mine used to work at the Traverse Theatre at its original home in the Grassmarket. There was a café there and she would give him a meal in exchange for a basket. In my childhood we came to Angus on holiday and that was where I saw benders, the temporary traveller dwellings made from boughs bent over with tarpaulins across, and traveller families outside. There were many traveller families in the Northeast of Scotland and they were able to stay by the side of the road in traditional sites. In those days they went to pick berries at the big farms in Perth and Angus and they also did the tatty picking. There were other farming tasks when a large work force was required for a short time and this was their way of earning an income. You would see many rows of caravans appear at a farm at harvesting time for the various crops and these were the travellers gathered together. They went their separate ways once this was over in groups of three or four caravans. 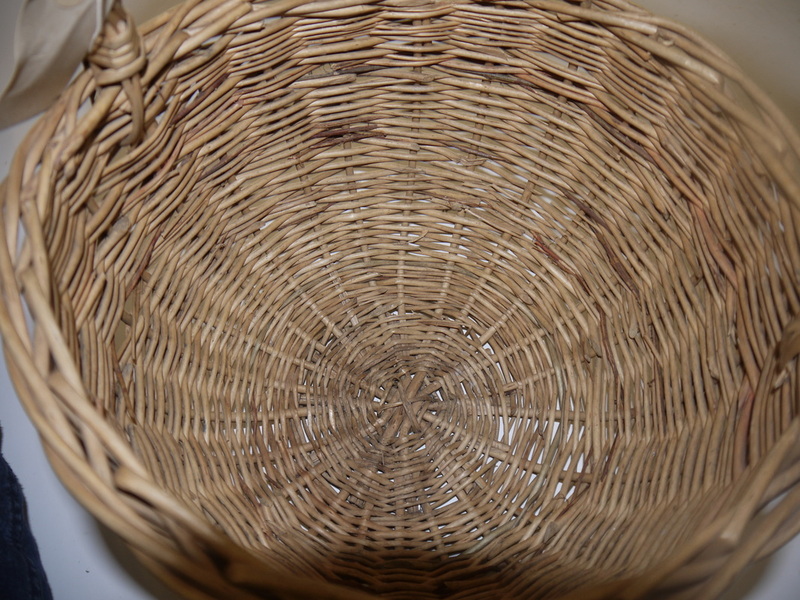 Another basket from MIntlaw, it would most likely have been used to pick berries. It was light and disposable. The handle is made from part of an old tin.